Plants annual; usually tufted, occasionally stoloniferous. Culms 10-100+ cm. Sheaths usually glabrous; ligules to 4 mm, erose or ciliate; blades to 30 cm long, to 15 mm wide, basal hairs to 4 mm, otherwise usually glabrous, occasionally pilose. 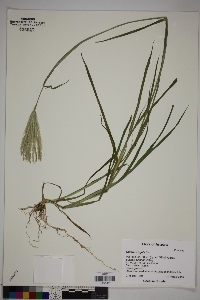 Panicles digitate, with 4-20, evidently distinct branches; branches 5-10 cm, erect to ascending, averaging 10 spikelets per cm. 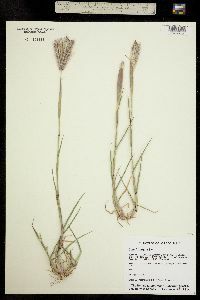 Spikelets strongly imbricate, with 1 bisexual and 1(2) sterile floret(s). Lower glumes 1.5-2.5 mm; upper glumes 2.5-4.3 mm; lowest lemmas 2.5-4.2 mm, keels usually prominently gibbous, glabrous, or conspicuously pilose, sides not grooved, margins glabrous, scabrous or pilose basally, with conspicuously longer hairs distally, hairs longer than 1.5 mm, lemma apices not conspicuously bilobed, awned, awns 2.5-15 mm; second florets 1.4-2.9 mm long, 0.4-0.8 mm wide, somewhat widened distally, not inflated, bilobed, lobes less than 1/5 as long as the lemmas, awned from the sinuses, awns 3-9.5 mm; third florets greatly reduced, unawned and shorter than the subtending rachilla segment or absent but the rachilla segment present. Caryopses 1.5-2 mm long, about 0.5 mm wide, elliptic. 2n = 20, 26, 30, 40. 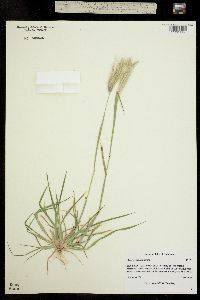 Chloris virgata is a widespread species that grows in many habitats, from tropical to temperate areas with hot summers, including much of the United States. It is a common weed in alfalfa fields of the southwestern United States. 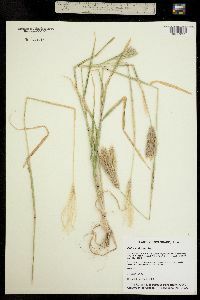 Spreading to erect annual 2-5 dm; uppermost sheaths inflated; blades 3-6 mm wide, tapering to a sharp point; spikes crowded, erect or ascending, 3-8 cm; glumes acuminate, fertile lemma long-white-ciliate on the margins distally and on the keel toward the base, its awn 4-9 mm; sterile lemma narrowly wedge-obovate, its awn 3-7 mm. Native to trop Amer., widespread as a weed in sw. U.S., and occasionally adventive in our range as far n. as Me.